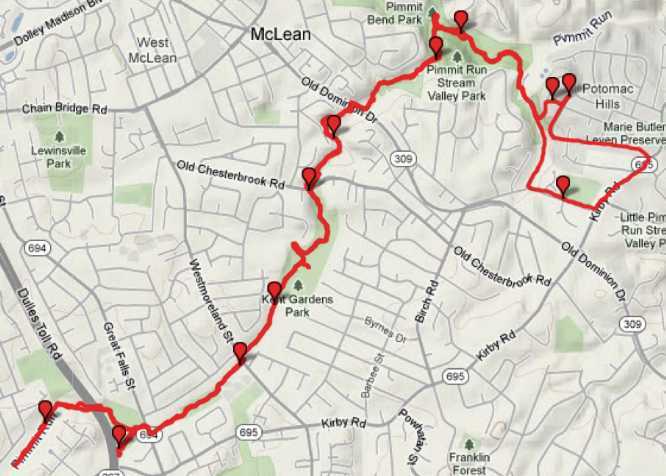 It's Game Day at John Ferguson's in McLean VA. After playing a round of Dominion that Robin's friend Tom Beigel wins handily I take a break to run for a couple of hours upstream along the Pimmit Run Trail, for which I've printed out a map. The house John and Jane are renting is in a gap of the trail's right-of-way, and my attempt to find its entrance leads me along neighborhood streets in a roundabout path. Eventually I arrive at the trailhead near the Highland Swim Club . The PRT is quite pretty as it meanders through neighborhoods and across a few busy streets. It includes several tricky stream crossings on stepping-stones. Blazes and trail signage are minimal and I get lost repeatedly, as the GPS trackfile illustrates. There's particular trouble near the I-66 bypass to the Dulles Toll Rd, where a wrong turn leads me into a brambly dead-end featuring a dangerous-looking narrow wet culvert under the highway. When I was younger I might have ventured to crawl through it, but no more. Four big deer watch with amusement as I cast about, give up, and backtrack to the true path. Pimmit Run Trail ends in somebody's back yard, where a fellow wielding a chain saw persuades me to turn back. The return trip is uneventful and includes only a couple of inadvertent digressions. On the street approaching John's neighborhood I find an unofficial short-cut and make it back in time to play Ticket to Ride, a railroad-building game.